Imagine you are coming out of the grocery store only to be greeted by an unsightly dent in the side of your vehicle. There is no evidence to tell exactly what happened, all you know is that it will have to be fixed. You may start to worry about the best way to fix it without using an unsightly filler, or having to redo the paint job. Both of these options can be very costly. There is a solution called paintless dent repair. If you are looking for dent removal services for your vehicle, then Pfaff Autoworks is the place for you! Paintless Dent Removal is a relatively new technique in automotive repair that is used to fix dings and dents in your automobile. It is a fast and affordable method that employs the services of an expert automotive technician to use specialized tools to get in behind the dent to push it out. This technique is administered in a very gentle and cautious manner to avoid inflicting further damage on your car. 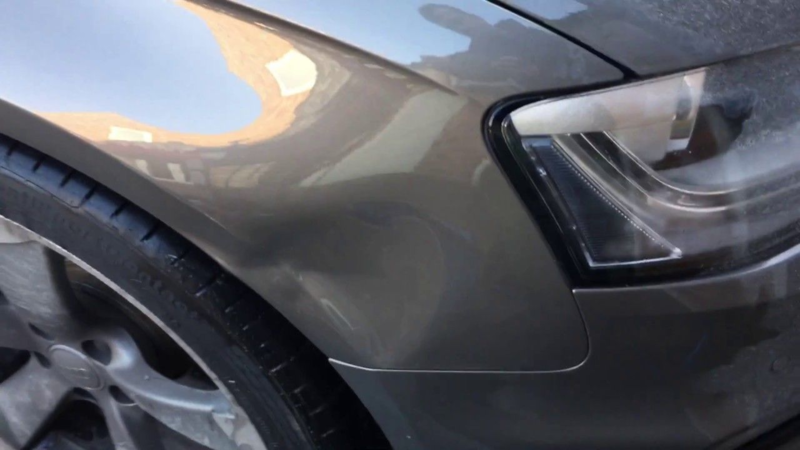 When done properly, paintless dent removal services will leave your car looking exactly as it had before the incident, conforming to the vehicles natural contours and design. Can paintless dent removal be used on my vehicle? Surprising, paintless dent removal can be applied to over 80% of all dings and dents incurred by vehicles. This is welcome information for car owners that have a blemish in their vehicle’s exterior, but don’t want to go through a huge hassle to fix it. PDR can be done quickly and efficiently. However, there are some dents that are just too big, or too serious to handle with this approach. The first thing that will need to be undertaken is an assessment of the damages. It will need to be established if the dent is deemed repairable through dent removal methods. An expert technician at Pfaff Autoworks will look at not only the size of the dent, but also where it is located on the vehicle. If the blemish can in fact be fixed with PDR, the next step is to find a good point of attack. This is why PDR should be left to the professionals. If you don’t know what you are doing, you will likely end up causing more harm than good. In many cases a part of the vehicle may need to be removed or maneuvered in order to get access to the back side of the dent. Once access to the back side of the dent has been managed, the next step is to repair using specialized techniques. If your vehicle is in need ot dent removal, it makes perfect sense to bring in into a professional shop that can get the job done correctly. Pfaff Autoworks has the state of the art equipment, and the highly trained and skilled technicians, to ensure that your vehicle is receiving the best dent removal service possible. For more information about dent removal at Pfaff Autoworks, please feel free to continue browsing through our website. Click here to find our contact information and to fill out our contact form.